This entry was posted on December 16, 2007 at 9:39 pm and is filed under "old things", antiques, anything, art, connetta, country roads, dino, family, forgotten, gas, gasoline, lucky shots, ohio, photography, photos, pics, picture, pictures, random, roads, shots, Sinclair, sinclair gas, Uncategorized, yesterday with tags "old things", $$$, connetta, dino, gas, gas stations, gasoline, landscapes, ohio, old days, photography, Sinclair. You can follow any responses to this entry through the RSS 2.0 feed. You can leave a response, or trackback from your own site. I love seeing all of the Sinclare oil stuff. My Great Grandfather was the founder of Sinclare oil. Hello, Neat post. There’s a problem with your web site in internet explorer, may test this? IE still is the marketplace chief and a good part of people will omit your magnificent writing due to this problem. 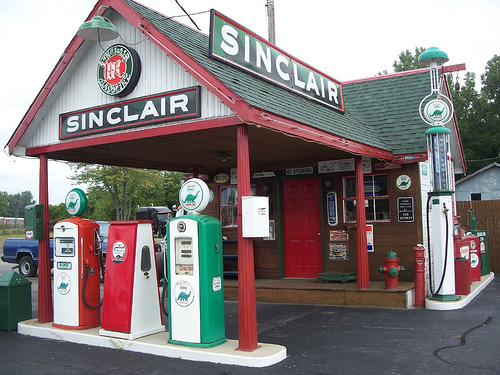 I too love seeing the old Sinclair pumps. My father worked his whole life for a oil company and eventually bought the business. Such wonderful memories. Thanks for sharing this picture! Wow! This brings on some great memories of a simpler life. Love it!